While mobile phone service to much of Egypt was shut off this past weekend, BlackBerry devices quietly continued to work (mostly), offering a crucial portal to the outside world. Will other countries pressure RIM to slam shut the access? 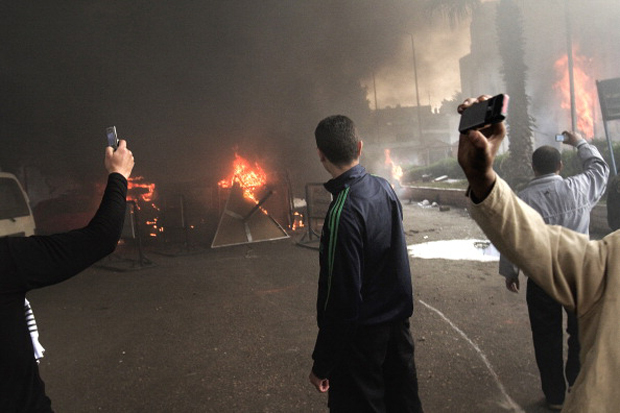 Egyptian protestors have discovered a powerful tool: BlackBerry devices. Stellar encryption appears to have allowed users of the devices to escape (for the most part) the Egyptian government’s crackdown on communications with the outside world. Shutting down BlackBerrys requires access to an entirely separate set of servers than other mobile units. This loophole indicates a possible motivation for earlier clashes between BlackBerry creators Research in Motion (RIM) and the governments of Saudi Arabia, the United Arab Emirates and Indonesia. These governments all demanded access to encrypted data sent via BlackBerry servers. In most cases RIM gave in, which implies to observers a connection between the firm’s attempts to stay in business within these countries and helping these governments shield against potential future protests organized via BlackBerry. BlackBerry devices have also been used to organize terrorist activities, such as the 2008 Mumbai attacks. This has been a frequently cited fear of governments in regard to BlackBerry encryption. However, some governments such as the United Arab Emirates seem to primarily target civil society protesters who make use of the devices. The Egyptian government never demanded access to BlackBerry data. The government is believed to lack access to decrypting messages and data sent by BlackBerry Internet Service. While the servers used by RIM for Egyptian BlackBerry service are located inside the country, access to data sent by BlackBerry appears to be outside the government’s hands. Users of BlackBerry devices faced intermittent service outages during the events of the past weekend, but nothing compared to users of conventional mobile devices. The outages seem to have varied from service provider to service provider. Users of conventional mobile phones faced a complete service outage. (BlackBerry’s market reach within Egypt has been limited due to the product’s high price point, and most Egyptians illegally accessing the internet did so through anonymizers such as the Tor Project and anonymous dial-up points). If the motivations of the UAE, Indonesia, and others in their efforts to monitor BlackBerries isn’t now apparent in the wake of Egypt, the goals of both India and Pakistan now are. The nations appear to have been spooked by the massive unrest in Egypt. The volatile Kashmir region has long faced the potential for large-scale civil unrest and Pakistan has been plagued by terrorism in recent months. Both countries have announced new demands this morning for BlackBerry creators Research in Motion: to give the two governments the ability to monitor and decrypt secure corporate e-mails sent via the devices. While much divides the two countries, both agree that BlackBerry’s secure data transmission constitutes a threat. In the wake of the protests in Egypt, it seems that fear of secure, encrypted data that cannot be accessed by government authorities is crossing borders. The question now is whether RIM will make agreements in South Asia similar to those it inked with Saudi Arabia and the United Arab Emirates. India is a huge market for BlackBerry, and it is unclear whether RIM will stand down and allow likely government surveillance under threat of a service ban. As of Monday morning Egyptian time, local cell phone providers Vodafone and Mobinil have restored the service, the Wall Street Journal reports. Attempts to immediately reach Research in Motion were unsuccessful.